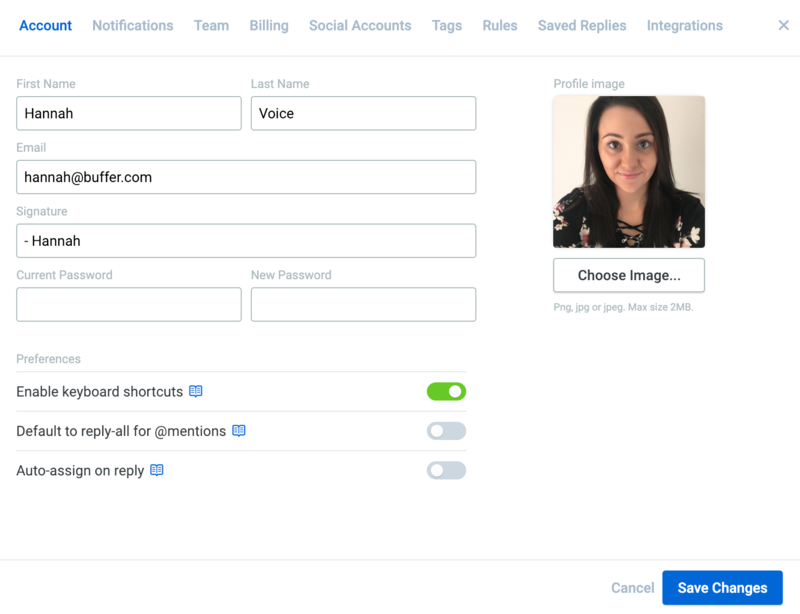 Each team member is able to customize their user profile, including name, email address, password, and signature. Head to Settings on the left hand side of your dashboard and then select the Account tab. Signature: All outgoing replies will be appended with the signature that you add here. Many teams use a dash and first name (-Hannah) or carrot and initials (^HV) convention. Profile image: Your profile image will be displayed to your other team member within the list of users who are online; next to your replies and any notes you add; and to indicate when you're looking at a conversation (collision detection). Users you respond to on social media will not see your profile image, but will instead see your company's social account image. Enable keyboard shortcuts: Keyboard shortcuts are available, allowing you to quickly and easily navigate the inbox and conversations, follow users, send replies, add emojis, and more. They're enabled by default, but if you'd like to disable them, simply switch the toggle. Default to reply-all for @mentions: By default, Reply will include only the author of the tweet you're replying to (as an @mention). Sometimes though, you might want to reply-all and include all users mentioned in the tweet. If you'd like this to be the default behaviour, simply switch the toggle. Auto-assign on reply: When enabled, this option automatically assigns a conversation to you when you send a reply. This can be great if you want to ensure customers only engage with one team member during the course of a conversation. If you'd like to disable this, simply switch the toggle. 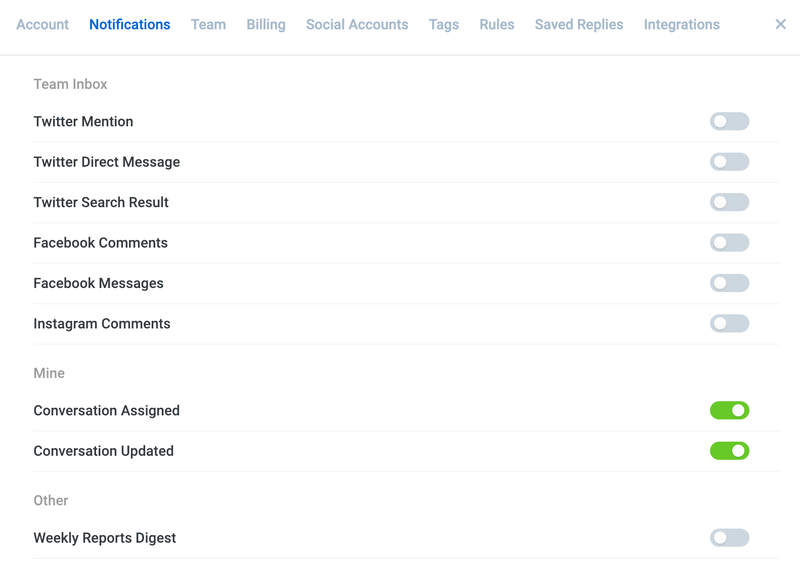 Each team member can also update their notification preferences by heading to the Notifications tab within Settings. You can choose to receive an email alert whenever you receive a specific message type, whenever a conversation is assigned to you, and whenever one of your assigned conversations is updated. You can also enable the Weekly Reports Digest, which will provide an email summary of your teams average time to first reply, your total number of new conversations, and your number of conversations that are currently open. Here's a peek at what that email looks like!